Members will have noticed that the US pages sometimes carry an earlier date than the main newsletter. This is because the US page is added to the main paper newsletter when it is circulated in the US in arrear of the UK edition, so it is actually published between UK paper editions. On that date Louis Bleriot, flying a monoplane of his own design made the first aeroplane flight across the English Channel from Baraques, near Calais, to Dover Castle in a time of 37 mins for 22 miles. The public impact of this flight has totally obscured the fact that it was not the first aerial voyage between the British Isles and continental Europe, which had been completed almost two years earlier. This was a flight by the balloon “Mammoth” from the Crystal Palace and flew as far as Lake vanern in Sweden. Like Bleriot, the aviator, or strictly aeronaut, was French, a Mons A F Gaudron, who also carried two passengers. The flight won a Daily Mail prize of £1000 and the aircraft was taken to Selfridges Store for exhibition. The most common Bleriot monoplane postcards, such as this one come from this event. Bleriot was already a successful businessman, exploiting his invention of an acetylene car lamp and took the opportunity to advertise these on the back of these Tuck cards. 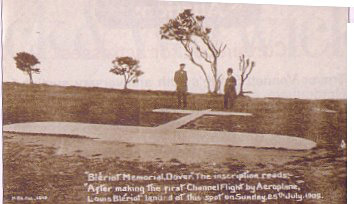 The site of the landing was marked with a commemorative stone in the shape of the monoplane. The cross-channel flight was the foundation of the Bleriot Aeroplane business. 800 variations on the basic monoplane theme were produced between 1909 and 1914 and shipped to aviators worldwide. 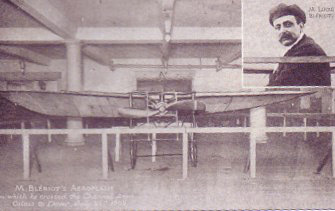 It was the first monoplane to be built in quantity. 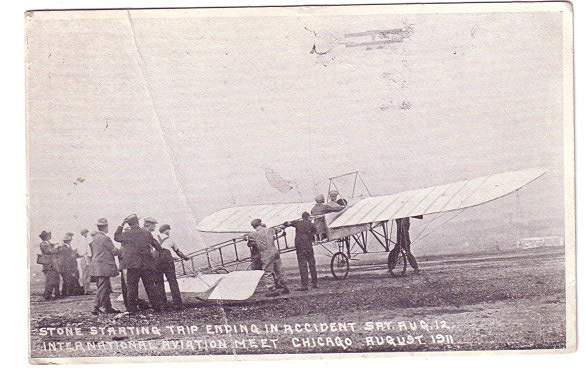 This one was at the Chicago meeting in August 1911 and is titled “Stone Starting trip ending in Accident Sat Aug 12”. Stone survived and by 1913 was in New Zealand with his Bleriot where he was attacked by a crowd in Auckland, having only flown 400 yards before crashing at a much promoted display. Seems to be a pattern there somewhere. The essence of the initial Bleriot design was its simplicity. Somewhere along the line this principal seems to have been lost by the time of the Bleriot 125 2 x 6 passenger twin-fuselage airliner prototype of 1931. In 1936 the company was absorbed into the state-owned SNCASO. Louis Bleriot, still active in his business, died in August 1936, aged 64. India has featured indirectly in recent articles, as a destination for both Imperial Airways and various distance flyers, including T Neville Stack. 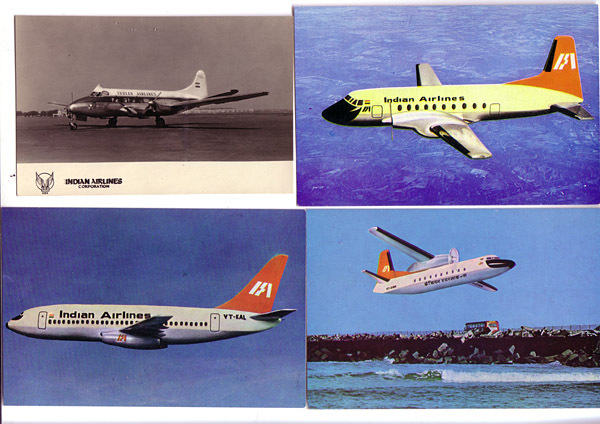 However, apart from some postwar airline issues the sub–continent features little on aviation postcards. This is offset to some degree by views of Air India at overseas destinations. This piece shows cards of Indian airlines at home and abroad covering the whole of British India but, post 1948, India only, excluding Pakistan & Bangladesh. The first two cards are of two principal airports of British India, Karachi, and Dum-Dum Calcutta. The Karachi card, by local printer Johnny Stores is of the Airship mooring mast erected there to receive the R.101 – which of course never arrived. 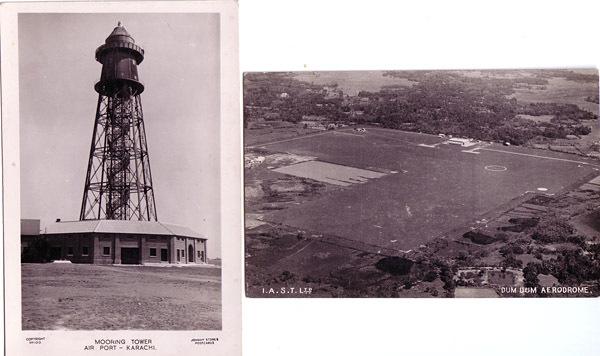 It was identical to those at Cardington and Montreal but the buildings at the base were distinctive. It was taken down for scrap in WW2 but the skeleton of the accompanying hangar remained until the 1950s. 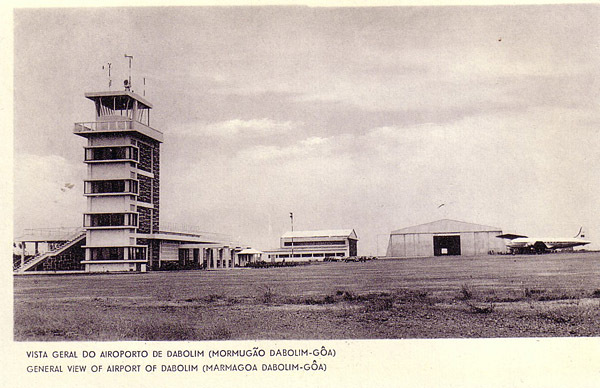 The second card, shows the early Dum-Dum aerodrome. The location was shared with a munitions plant where the eponymous anti-personnel bullet was made. Both airports still exist on the same site but both have been re-named – Karachi for Mohammed Jinnah, founder of Pakistan and Calcutta for Chandra Bose who formed an Indian Army to fight with the Japanese. Whereas most Empire aviation was dominated by Imperial Airways. 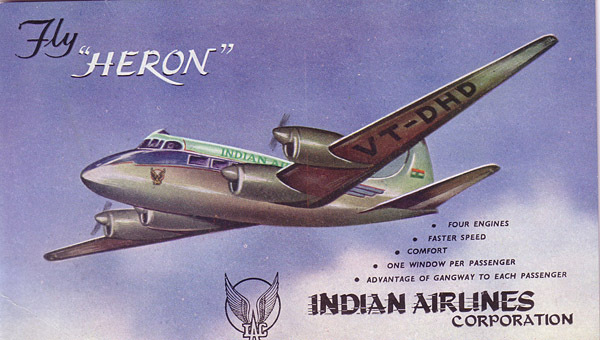 Supplemented by some settler-founded companies such as Wilson Airways in Kenya, India was different. From the beginning there were local initiatives and the Bombay Parsi business dynasty of Tata was prominent. Even in the 1930s this was a 50 million pound manufacturing business with interests in steel, power generation and textiles. J R D Tata was the first Indian to hold a pilots licence and made the first mail flight from Bombay to Madras in a Puss Moth in 1932. Today the Tata group has developed a taste for acquiring failed British companies (British Steel, Jaguar, Land-Rover) – maybe an incentive for British Airways and BAe to find a way through the depression. By the outbreak of WW2 Tata Airlines was connecting the major cities of India with a deHavilland fleet ranging from Fox Moths to the DH.86. 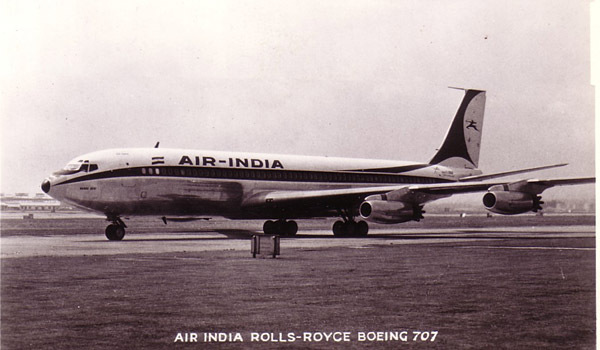 Post War Tata Airlines was renamed Air India and, on independence in 1948 formed an international carrier Air India International to operate Constellations. L749 VT-DAR featured on two TVAP cards at Heathrow. 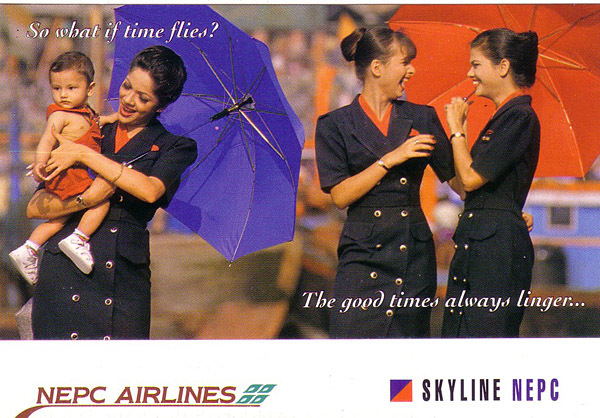 A badly-drawn Heron also featured on this Indian Airlines oversize item – it is not PC backed, nor is it plain backed. The back is a blotter. So far we have no airline-issue cards. 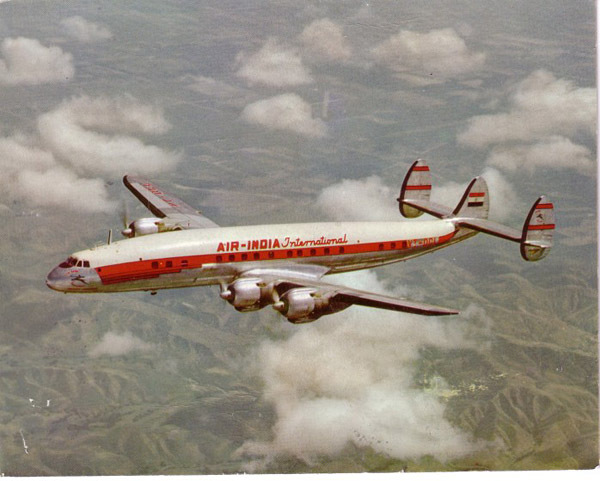 The first such was from Air India, again oversize and featuring Super Constellation VT-DGL. It had been preceded by B&W versions from the same over mountain flight but these have plain backs and exist in two sizes of the Constellation image. VT-DGL passed to the Indian Air Force in 1962 and to the navy for maritime reconnaissance in 1976 and based at Goa until scrapped in 1984. Goa had remained a Portuguese enclave in India until 1961 when it was annexed into the republic. 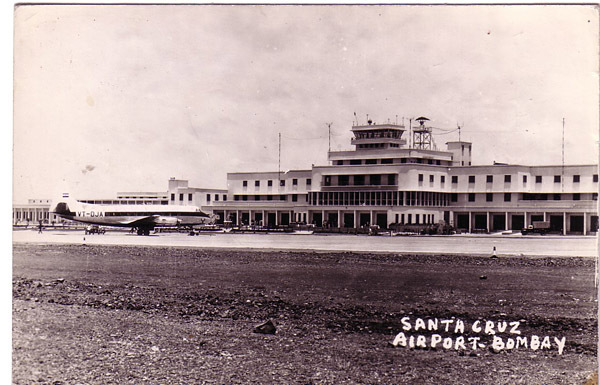 This card of Dabolim airport is from the Portuguese period and includes a TAIP (Transporteos Aereos India Portuguesa) DC-4. 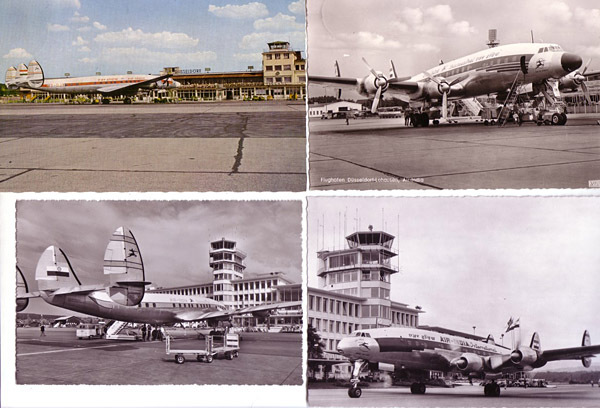 The time of Air India’s Super Constellation services to Europe coincided with the peak of airport postcard photography – here are four top class examples. Top left L1049G VT-DJX at Dusseldorf on Walter bales 178c. 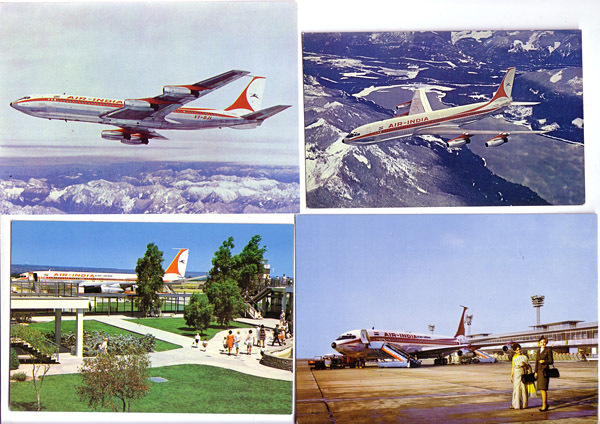 Converted for Cargo with Air India 1960 after only 2 years service, then Air Force 1962-1984. Top right L1049G VT-DIM also at Dusseldorf by Kessel-Karte. To Air Force 1961 and Navy 1976. Bottom Left L1049E VT-DHL at Zurich-Kloten on Photoglob-Wehrli f712. Also to the Air Force 1962 and Navy 1956, where it became the last Indian Constellation to fly in 1983. Bottom right L1049G VT-DIM again – this time at Zurich-Kloten on Swissair Photo 6815. 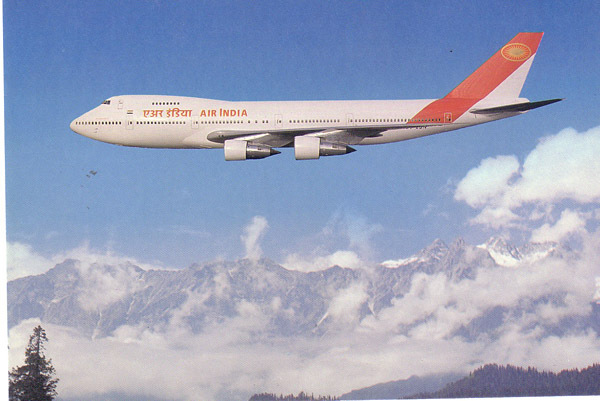 With the delivery of its first 747 in 1971 Air India commenced service to New York. Since then the fleet has been largely 747, supplemented by a few Airbus A300 and 310 and now moving to 777’s. The “moghul window” colour scheme was used for most of this time, having been re-introduced after a more “modern” scheme was briefly trialled , and is only now being changed on the 777s. 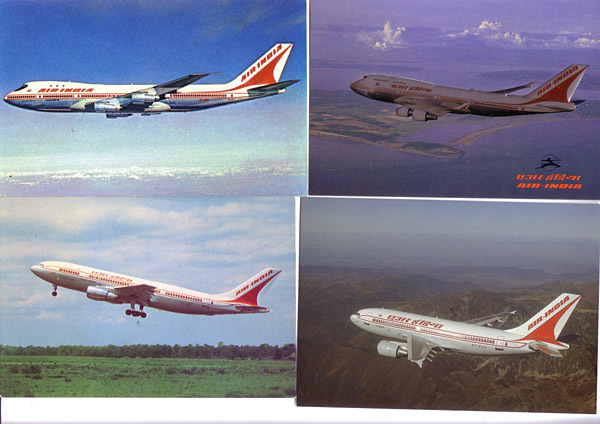 One “boring” airline issue showed the windows of a 747 from the interior – cards from the same set with cabin crew are among the rarer Air India issues. 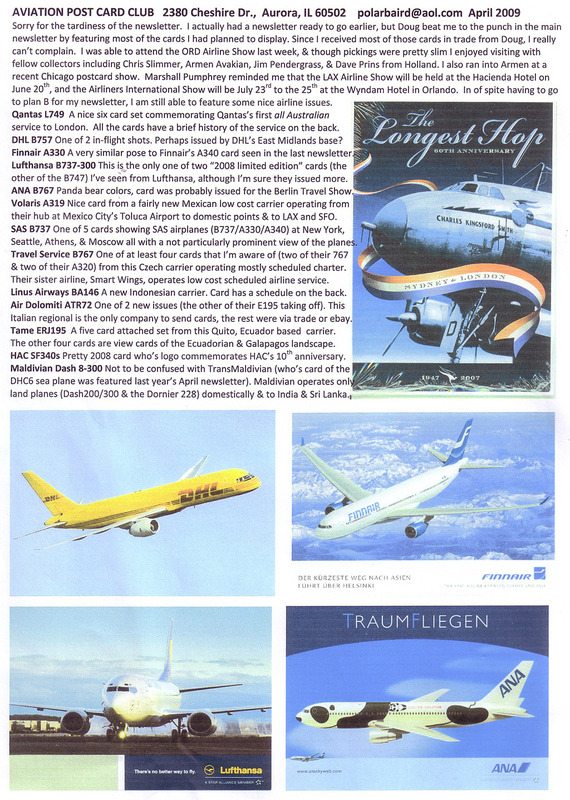 Here is the scheme on both versions of 747 and Airbus on company cards. The 747-400 is silvered and embossed. From 1992 India started to de-regulate air transport. From a number of start-ups Jet Airways and Kingfisher have emerged as major players. To compete, Air India took over Indian in 2007. 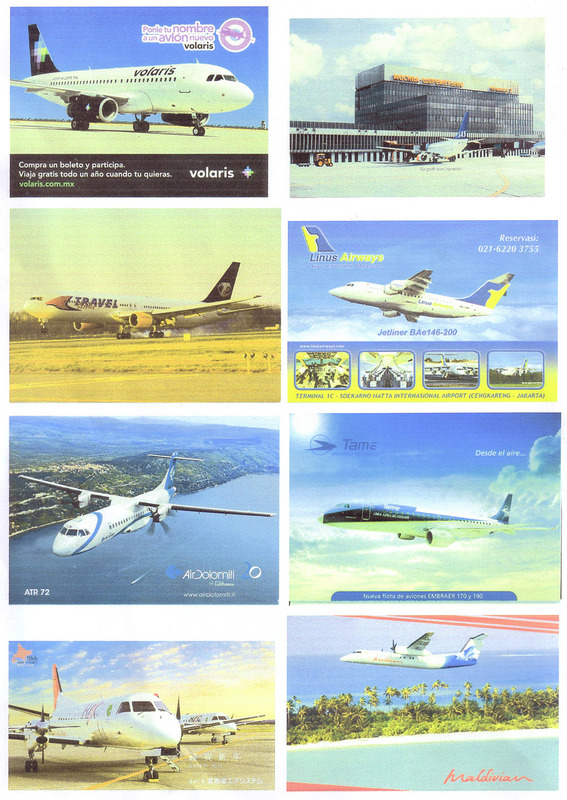 The last Indian AL cards feature their now all Airbus fleet and there were a few cards from the start ups too. Top – last Indian A320 card. Jet Airways 737-800. Bottom Modiluft (Lufthansa associated) 737-200. Air Sahara maintains the tradition of badly drawn 737s. before merging into Jet in 2007. It has been said that the last traditional Englishmen, cricket loving, tea drinking, stamp collecting , caste/class conscious etc are Indian. 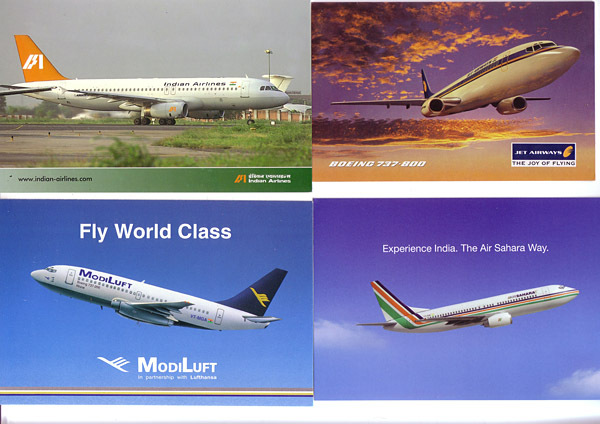 With the rise of Indian business houses this is probably out of date there as well as here which begs the question as to whether these relics of Indian airline history will be sought out in India itself. With bidder details now suppressed the recent big price for an Indian AL Viscount gives no clues.